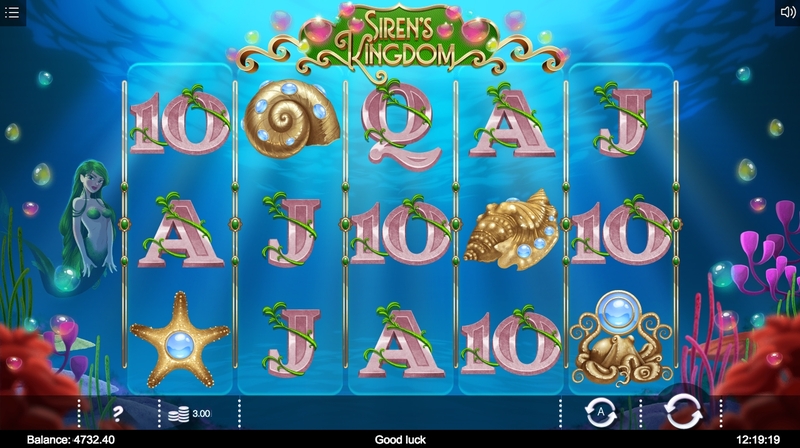 Siren’s Kingdom slot is an underwater-themed game from Iron Dog Studio. History reminds us that aquatic-inspired titles are popular with players, with examples being Novomatic’s Dolphins Pearl Deluxe, Playtech's Great Blue and Play’n Go’s Mermaid’s Diamond. A first look at this slot shows clean graphics, very fitting of the theme. The sounds also work very nicely, but you may find your finger hovering over the volume control and the volume shoots up and down in intensity. So will these siren's make a splash with our balance or will we be feeling a bit sea sick? 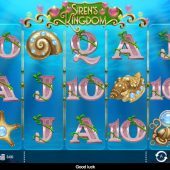 This 5 reel slot has 3 rows and 30 fixed paylines. The picture symbols include various golden shells with pearl icons, with the largest rewarding 400 coins for 5-of-a-kind (5OAK). The lower paying symbols include A-K-Q-J-10 which will reward you between 40 - 150 coins for a 5OAK. Taking an element from their popular slot Blood Queen, Iron Dog have included expanding Wilds in the base game. Whenever a Wild appears in any top position on the reels it will expand to cover that whole reel, with more than one able to appear in any one spin. These can create some decent base game wins. To trigger the free spins feature you need to land 3, 4 or 5 bonus scatters (Octopus with pearl) in a single spin. You will then be rewarded with 14, 25 or 36 free spins respectively. During the spins, should you see a Wild then it will remain for the next spin plus an additional 2 Wilds will appear adjacent to it. Where this get really interesting is when you get multiple Wilds in a single spin, it can certainly get quite exciting.